The Jekyll and Hyde Laboratory: Dr Jekyll and Mr Hyde in "Wishbone: Mixed Breeds"
Dr Jekyll and Mr Hyde in "Wishbone: Mixed Breeds"
To many children who grew up in the 90's, the word "Wishbone" is a familiar one. It conjures up memories of a television show in which a cute dog with a wise-cracking voice-over taking on the roles of characters from famous stories and getting dressed up in adorable little doggy costumes. Although I hadn't watched it regularly, I remember some of the episodes fondly, especially the one based on the Hound of the Baskervilles. 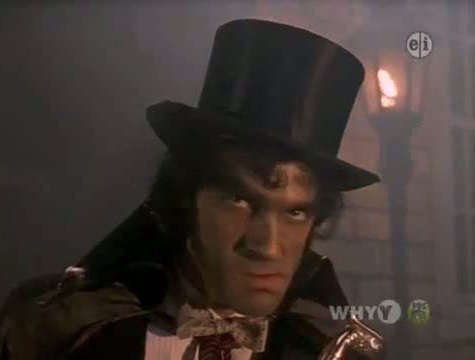 So as you can imagine, it delighted me greatly to learn that there was an episode of Wishbone about Dr. Jekyll and Mr. Hyde. I really ought to have known there would be one, since I'd already read books about J&H that featured Wishbone, one called "Dr. Jekyll and Mr. Dog" and the other "The Strange Case of Dr. Jekyll and Mr. Hyde: Wishbone Classics". 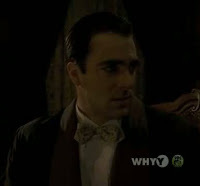 The first one is pretty much the episode in book form, and has Wishbone playing the role of Utterson. The second is a simple abridged version of the book, with the token dog decorating the pages and giving insight into the story without being included as a character, plus some added material to help young readers understand the story. I really wish both of them had featured Wishbone all done up in a suit and a cravat, because it's adorable and I can't get enough of it. 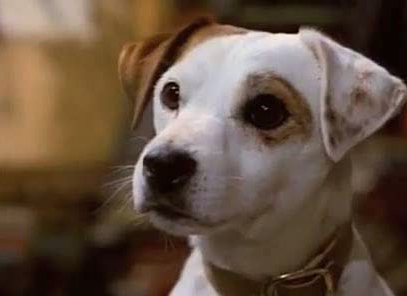 The episode, as is typical with Wishbone, follows two storylines. One is set in the real world following Wishbone's adventures as a normal dog (as normal as a dog with a constant sassy inner monologue and a vast knowledge of classic literature can be) as well as the happenings of the human beings in the world around him. The other one is set in whatever story Wishbone is thinking about, and stars Wishbone as one of the characters. Usually, the plotline set in the real world deals with events and issues that have some resemblance to the story Wishbone imagines. 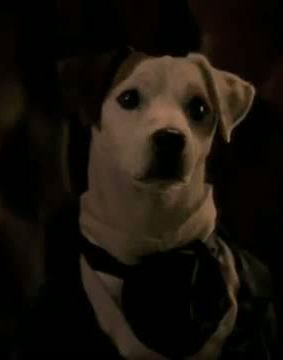 In the episode of Wishbone about Jekyll and Hyde, called "Mixed Breeds" (which I wished they'd called "Dr. Jekyll and Mr. Dog" like the book, to be a bit more clear) Wishbone takes the role of Gabriel Utterson in the plotline based on Dr Jekyll and Mr Hyde. This plotline stays pretty faithful to the book- not perfectly, but certainly more than I expected. For your viewing enjoyment, I have uploaded the full episode and embedded below. However, if you're only interested in watching the parts involving the re-imagining of Dr. Jekyll and Mr. Hyde, I have edited together a version comprised of just those. Please forgive the clumsiness of some the transitions, my freeware video editing program is great for some things, but not fading to or from black. I personally was quite surprised by the quality of the Jekyll and Hyde storyline. 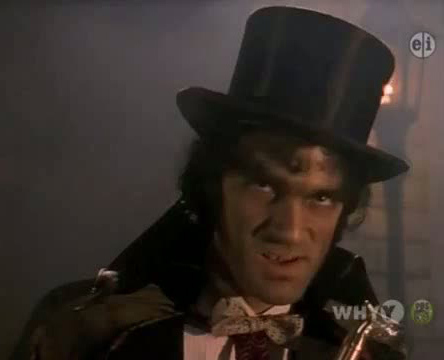 I like the actor who played Jekyll and Hyde, and the way they chose to have either half of the dual role portrayed in terms of acting and appearance. The sets were surprisingly good for a childrens television show, the secondary actors worked well, Wishbone was adorable.. I could find nothing to really dislike about it. Of course, it had parts that were inaccurate in terms of the original story, such as the scene set in a bar, but it was much less off-the-mark than most video-based adaptations of the original story. There were also several instances over the course of the episode which made me explode into laughter, which is always a good thing. One specific case was when Hyde exited the laboratory after his transformation via a secret passage behind a bookcase, and when he slams it shut behind him a bunch of books fall off and hit the floor. That kind of thing never happens in non-comedic movies! It just broke the atmosphere of the whole scene for me, and I loved it. Otherwise, I always get a kick out of a Hyde who tries to act intentionally evil, in a sort of cliched way. I think it amuses me partly because it reminds me of John Hannah's performance in the role. He was hammy as hell, and utterly hilarious for it. So in this episode, I was having enough fun just watching the Wishbone Hyde acting in an overly-dramatic villainous manner, but then when he started trying to laugh evilly I lost it! I just couldn't take it seriously, no matter how much the show seemed to want me to. Overall, I thoroughly enjoyed Wishbone's take on the story, and the episode as a whole. I hope you, dear scarce readers, did as well. I enjoyed reading your review of this episode of Wishbone and am happy to see some out there who still enjoy this show! I grew up with this series and avidly collect memorabilia from it today. I thought you might be interested in seeing the Dr. Jekyll & Mr. Hyde plush Wishbone I have in my collection.